It has been one year since I had my Mitral Valve replaced. I cannot believe how fast this past year went by. I am thankful every day, that I have not had any complications due to this surgery. It is the Thanksgiving season, so I would like to just say again how thankful I am to have had a brilliant surgeon and a wonderful team of doctors to take care of me. I really couldn't have asked for a better outcome! Thanks again to all of my family and friends for your continued support and love. And thanks to Adam for making this site available to all of us, I know I couldn't have made it through this journey without all the information and support from people going through the same thing as me. I have the St. Jude’s Mechanical valve and have been on Warfarin for 1 year now. I know that a lot of people have side effects and problems on this drug, but I have not had one single problem with it. My INR is always in range and has been since very early on. I watch what I eat, but I still have the things I love every now and then. I haven’t had any bleeding problems or any other complications. I'm so thankful that I haven't had to struggle with taking this drug and I hope that I will continue to have success with it. I can still hear my valve clicking away. I am definitely more used to it. I try to read as many stories as possible, but there are so many of us that sometimes is hard to keep up and I think once you’ve come out of the surgery successfully the need to connect with others going through it gets less and less as each month goes by. But I wish everyone going through it now, or in the future good luck and I hope you have as well as experience as I have. Time has just flown by, I can not believe that I am celebrating my 9 month since surgery day today. I am doing so good. I'm back to doing everything I was doing before surgery and then some. I'm exercising regularly and I feel great doing it! In September I am doing my very first 5k ever, I have never done one before, so I am really excited to do it. And as a bonus it's the American Heart Associations Heart Walk/Run, so it is for a organization that is very important to me. I'm very excited and happy to raise money for them and I'm so thankful that I am able to participate in this event. it...hearing it let's me know my heart is strong and beating! Lol! My coumindin levels have continued to be really easy to maintain. I do pay attention to vitamin K a little, but I don't avoid it all the time. I am so thankful that I have been able to have a good experience with coumidin thus far. I haven't had any major episodes of bleeding or bruising in anyway. I hope that it continues to be that way for me. I haven't updated my journal for quite sometime, but I do read other peoples updates as much as I can. Good luck to everyone who is new to this site and are just begining their journey. Thanks again to all who have given love and support to me during my journey, you all made this process so much easier then I ever thought it would be! It has been 4 months since my Heart surgery and I am doing great. Most of the time, I feel like I didn’t even have surgery. I would say I’m 95% back to my “normal” self. That last 5% is more mental healing that needs to be done, not physical. I spent 18 years with that little pig valve in my heart, thinking and worry about when it would need to be replaced again and now that it has been replaced, It’s hard to not worry about something happening to this mechanical valve and having to have it replaced as well. I went to see my Cardiologist for a follow up yesterday. He reassured me again by saying that this valve should last for the rest of my life. He said it sounded great and my echo showed no issues. This surgery was a huge thing for me to get past. Spending all of my adult life thinking “when is it going to be time” left a huge impact on me. I really believe that Mac and I were supposed to come back to Houston just for me to have the surgery here in the wonderful facilities at the Texas Medical Center. A second surgery has more risks, and I am greatful that I was lucky to have a wonderful and talented surgeon do mine. So I guess as the day’s go by I will learn to trust that I’m going to be fine and hopefully I will get to a point where I don’t think about it at all. My INR continues to be in the acceptable range. I have not had any problems with my blood getting and staying in the range. If it gets out of range because of something I ate or took, they adjust my meds for a couple of days and it falls right back in range. I have been lucky that I haven’t had any side effects or complications because of the Coumadin. I am learning everything I can about it and trying to incorporate it into my life. And it hasn’t been that big of an adjustment. I hope that will continue to be the case. Thanks again to all of my family and friends for all of your support during my time of need. I love you all very much! It has been 12 weeks since my open heart surgery. Wow! I can’t believe how fast the time has gone by. I pretty much feel like nothing even happened. I graduated from my rehab program last week and that feels great. I have returned to doing normal workouts that I was doing before I had surgery and I can tell you that the way I feel now during and after exercise vs. what I felt then are night and day. Sometimes I think why didn’t I have heart surgery sooner. LOL! I can’t even explain how much of a difference it is, and in only 3 months…it’s amazing and I have so much gratitude for my surgeon and his team. Yesterday I was running at a higher speed then before and my heart rate was 30 beats per minute lower then what it used to get up to…it was amazing…I could breathe…I loved it and I felt so good! I have some aches in my sternum, but nothing serious at all and it’s barely noticeable, still working on doing pushups and planks, but I’m getting there. I really feel like I will enjoy exercising so much more now. My INR continues to stay in the “acceptable” range and has been for some time now. For me taking Coumadin really hasn’t required too much of a lifestyle change. Hopefully that continues to be the case. I still hear my valve clicking away, but I’m really used to it and it’s getting less and less noticeable. It’s amazing to me that almost every day another person joins the journals and shares their story. I never realized how many people are affected by heart valve disease. I’m just so grateful that I found Adams blog, because all of these stories and all of these people helped me very much in my own journey. It’s a connection that we all share and a connection that we all understand and I am grateful for it. Good luck to all of those who just had surgery or will be having surgery very soon. You’re in my thoughts and prayers! Thanks again to all of my family and friends for all of your love and support. I can’t thank you enough for what you have done for me. And each one of you played a huge part in my recovery and success. I love you all so much. I was very nervous to have surgery here in Houston with the majority of my support system being in Salt Lake City but, to all of my friends in Houston, I don’t think I can say Thank You enough for all of your willingness to help me out in all the ways that you did, you have all shown me what true friendship is and I appreciate it more then I can ever express. You are a great group of ladies and I’m so grateful to have you all as friends. Thank You to everyone who spends the time reading my journal I hope that my words help you in some small way. Well it has been a little over 8 weeks since I had surgery. I still continue to feel better every day. I still have some stiffness and aches in my chest, I think it’s because I have had my sternum broken twice and because there was more scar tissue from the first open heart surgery. I am able to lay on my side at night for a little while, but not all night long. If I lay on my side or sit for too long I’m pretty stiff when I get up. I notice that I stand up and I hunch forward automatically, so I’m working on trying to correct my posture… I’m doing re-hab with my trainer and that is going really good. I definitely notice a difference in the way I feel while I exercise. I can breathe!! And I feel like I am getting more oxygen to all of my muscles. Also, my heart rate comes down a lot faster than it used to. I haven’t tried any strength training yet, but I’m hoping to do some light weights next week. It’s all really exciting to me and I am encouraged by all of these feelings. This past week I have been trying to learn as much as I can about Coumadin and how it works with my mechanical valve. Just trying to learn what the best diet for me will be is interesting and sometimes frustrating. There are a lot of foods that have vitamin K in them, so I’m just trying to balance everything out. But I will get it and hopefully I will get used to those limitation or challenges soon. My INR levels continue to be in the acceptable range. I still hear my valve clicking away. But it is a welcomed sound and it isn’t irritating or bothersome in anyway. . It is getting more and more normal and I don’t hear it all the time. It doesn’t keep me up and night. I think it actually helps put me to sleep. lol... Sometimes I find myself stopping whatever I am doing to try and listen for it…I like to hear it…It helps me! Thanks again to all of my friends and family that have encouraged me on this journey. I love you all so much and I feel grateful to have you all in my life! Today it has been 7 weeks since my surgery. I feel great. Mac went back to work yesterday and the kids went back to school today. So today was my first day at home by myself in what feels like forever. It’s a little sad and I miss them. But it’s also good to get back to a normal routine. I started re-hab with my personal trainer this week. Monday we took it pretty slow just to see where I was at, but today I feel like I really had a good workout. It is the first time since surgery that I actually broke a sweat, had red cheeks and had to wipe my face off with a towel. It felt so good! Thanks Traci!! And I have felt really good all day since. My pain is a lot better this week too. I still have some stiffness in my chest. My range of motion is not quite back yet so, things like driving and stretching are interesting. Turning the steering wheel in the car is probably the hardest thing, but I can do it, I just have to move my hands around the wheel a lot more and it looks pretty funny! My kids think I’m strange…ha ha ha… Overall I feel really well. The past 7 weeks are starting to feel more like a distant dream. I continue to feel blessed by modern medicine and blessed that a man made valve is keeping me alive and healthy. My INR (blood thinning) levels have been in the normal range since before Christmas and have stayed pretty much the same, so lucky me I have only had to have my blood taken every two weeks for the last little while. Hopefully that continues to stay the same. Thanks again to all of you have kept up with my progress and all who have sent encouraging words my way. Your thoughts and prayers truly mean the world to me. 6 weeks has passed since I had surgery to replace my Mitral valve. Today I can drive, which I did. My range of motion is still not 100% so that makes driving a little interesting but I did it and it was ok. I can take a long hot bath in my big bathtub, did that this morning as well. I can pretty much do anything that I was doing six weeks ago, not that everything is easy, but I can at least start getting back to doing things that make me feel normal. My pain today verses last week is a lot better. I have some stiffness after sitting or laying for long periods of time. But I do not have the “someone is sitting on my chest” pain anymore. I can't believe that 6 weeks has past, it seemed to fly by. I sometimes feel like I have been in a dream the last two months. I’ve been thinking back to the morning of my surgery, I was so anxious and so nervous. I remember kissing both of my children goodbye, wondering would this be the last time I get to kiss them goodbye or hold them. I worked hard to bring these two babies into mine and Mac’s life, surly god wouldn’t take me away from them yet? At the hospital, I said goodbye to my parents. Me and Mac went to the holding area for about an hour. We chatted with some of the nurses, talked with each other and I think I went to the bathroom a million times that hour...the surgical team came and got me, I hugged Mac and thought please god, don't let this be the last time I ever get to wrap my arms around him or kiss him. Our life has been complicated and we have been through so much together, please don’t let it end here. It's hard when you’re facing this particular type of surgery not to think about that stuff and all of the complications that can happen. I mean they actually stop your heart from beating, how is it possible to not be nervous about that. But Thank God mine started back up, and one of the nurses even said it was probably beating stronger than my husbands or parents were that day. 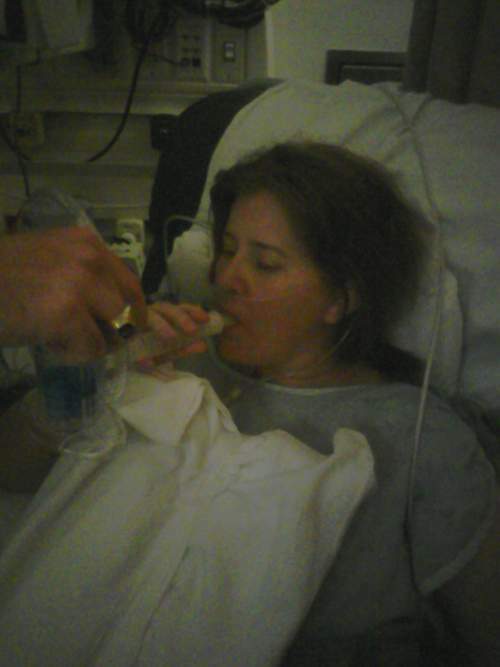 The next things I remember, hearing Mac's voice telling me that I was done, my valve was fixed and I was ok. He told me to squeeze his hand if I could...I squeezed it hard, I squeezed my mom’s hand too. I heard the nurse tell me to lift my head up if I could...I couldn't...I fell back to sleep. I woke back up later....the breathing tube was there...I didn't like that breathing tube...I gagged, the nurse told me to take a deep breath and the gagging would pass...so I did and it passed, she told me to lift my head again this time I did it. I fell asleep again...I woke up again, I gagged again, she told me to keep taking deep breaths they were going to get the tube out right now, she was waiting for someone to come and do it, but they were late, she was about ready to take it out herself but the person she was waiting for finally got there...take a deep breath, I did and they pulled the tube out...it sucked, but I was so happy that it was out...I needed Ice...I fell asleep again...I woke up to Mac's voice, he was there and he brought some people to see me...I turned my head and saw my two beautiful babies...I was so happy to see them and I think they were very relieved to see me and to see that I was ok. I saw my mom and dad, they were happy that the tube was out...I saw my mother-in-law, I think she was relieved to see that I was ok to.. I will never forget those memories from that first day in ICU... I'm thankful everyday that I had such a wonderful surgeon and surgical team. I think that I have spent the last 18 years since I had my first open heart surgery thinking how hard the next surgery was going to be and worrying about how I was going to get through it or how tuff it was going to be on me. And now it's over and I'm ok...I can’t believe it’s over, of course I still have healing to do, but right now I feel great. I feel very blessed to have not had any complications. I'm excited to put my valve to work. I want to breathe heavy and not feel like crap when I'm working out...I'm starting rehab with my personal trainer next week. I can't wait! I will never be able to say thank you enough to Mac. He has been so supportive and he has taken such good care of me and our children, I really could not have gone through this without him...he has pushed me and helped me in everything that I needed to do. I love you so much. It has been five weeks since I had surgery. Each day I continue to feel better. I still have a lot of stiffness in my sternum, mostly if I lay or sit in the same position for a long time. So, getting out of bed in the morning takes a few extra minutes. Other than that I feel okay. This week I seem to have been struggling more mentally then physically. I’ve had a few days where I have been a little down. I think I have had these statements in my mind… “I just need to get to 6 weeks” or “as soon as I’m a six week recovery then I will be normal and fine again”. Well next week is the 6 weeks and I don’t know if I will be” magically” back to normal. I know that I will be able to begin doing most of my normal daily activities, like driving my car and taking a nice bath. But there are still going to be things that aren’t real easy to do and I’m a little nervous to start doing some of them again. I want to get back to my normal routine as soon as possible, but I’m scared that it may take a little longer then I want it to. I guess I just need to be patient and remember that my body is still healing. I have read a few journals about people who have or may have to have surgery again because the first attempt was not successful. I feel so bad for them and it is a little scary to think about what I would do if that were to happen to me, I absolutely do not ever want to do this surgery again. I’ve done it twice and I think each time it is harder to recover from. Even though everything in my case has gone very well, I still cannot imagine doing this again. My thoughts are with anyone who is in this situation! This week I set up some rehab appointments with my personal trainer. I’m going to begin working out with her after the New Year. I cannot wait to get back to working out like I was before the surgery. I’m sure it will take some time for me to get my stamina back, but I’m really excited to put my new valve to the test and see what it can do and see how good I will feel. I’m looking forward to exercising really hard, which is something I have never looked forward to. From the little bit of exercise that I have been doing, I can tell now that I didn’t realize how bad I was feeling before surgery. I think my body just adapted to feeling that way and I thought it was normal. I’m so excited to feel what normal should really feel like. Today I went and got a mani/pedi. It was my first one since before the surgery. It was so nice to do something that was part of my normal day! Now my feet and fingers look all pretty for Christmas! I just want to Thank you all again for all of your kindness, love and support. I’m so glad that I didn’t have to go through this experience on my own. I am very Thankful to have such an amazing support system. This website and Adam’s blog have helped me so much. It is so nice to talk to people that are going through the exact same thing that I’m going through. Reading everyone’s story has helped me in my recovery everyday! I thank all of you who have shared and I thank Adam for his book and for creating this website. My family and I want to wish you all a very Merry Christmas and a Happy New Year! 2012 is going to be an awesome year! It has now been 4 weeks since my heart surgery. I can’t believe that much time has passed. It’s strange, it seems like it was just yesterday, but it also seems like a long time ago. I am just so glad I am at this point and I am definitely recovering. Each day gets easier. The pain and stiffness in my chest and muscles gets better every day. I still have soreness in my sternum, but these last few days that seems to be really lightening up. My INR is pretty much in the therapeutic range so I do not have to get my blood drawn for 2 weeks…That is way better then every couple of days. Today I did something huge…well it felt huge, I got on my elliptical machine and exercised on it for 10 minutes. I rested a little bit after 5 minutes, but it felt so good to get my muscles moving and my heart beating fast again. For the first time in my life I’m really excited to get on with working out. I want to get back into shape so badly. I can’t wait until I can push myself and hopefully run a marathon one day…well maybe a 5k…but you have to have goals right?….lol.. Thank you all for your continued support while I go through this experience. Just taking the time to read my journal means the world to me. I am lucky to have such an amazing family and friends. Thanks again to all my Houston friends that are bringing us dinner each night, it has been so helpful not to stress about what to do for dinner…Mac and I truly appreciate your thoughtfulness and love. I also want to tell my husband that I am so grateful that I have him and that he has been here for me all this time. He is doing so much to run or household and take care of our children. He does it all without compliant or frustration. He is my rock and I don’t know how I would be this far along without him. He helps me to stay positive everyday! I love you more than words can say! Thanks for everything you are doing for me. I also need to tell my children, Joey and Mackenzie thank you. They have been the best kids these past weeks. They have made my recovery go so smoothly because I haven’t had to worry about them getting up for school, fighting or even doing household chores. They have helped out in everything that we have needed. They are the best kids ever!! I’m so glad they are mine…I love you both with all of my heart…the robot part included...lol... (Mackenzie thinks I am part robot now that I have a mechanical valve) so sweet! Talk to you all very soon!! So it has been 3 weeks since I had surgery. Everyday I feel better and begin to do more "normal" stuff. I still can't do a lot, like heavy cleaning, lifting anything over 5lbs, or driving but I'm slowly starting to do some stuff. I still have some pain in my chest and back, I think it's mostly from the actual open heart procedure and how I was positioned on the surgical table during the surgery, hopefully each day that will get better. I still hear my valve clicking every day, it sounds a lot like a small watch, I worried that I would be annoyed by that when making the decision to have a mechanical valve, but honestly it does not bother me, I'm glad to hear it, it's a reminder of what I have been through and that this small little part in my heart is keeping me alive.. I will always be thankful for that sound. I went to see my cardiologist yesterday for the first time since I was discharged from the hospital. He did an EKG, which looked really good and he listened and checked me over. The swollen pericardium is now gone, which is nice and my valve sounded like it was functioning very well. He was pleased with my recovery so far and said everything was going well. My incision is healing perfectly, it’s almost a perfect straight line and in no time it will blend into the first scar and I’m sure it will be barely noticeable...I do not need to see the cardiologist or any doctor for 3 months...this is amazing to me, that you can have such a serious operation and go months without seeing a doctor..Modern medicine is just amazing. My parents and mother-in-law left Houston on Sunday, it was so nice having them here to help us for almost 3 weeks. I honestly don't know if we could have done everything by ourselves. We truly appreciate everything they have done and will continue to do for us. We love you all so much!! Thank you again from the bottom of my heart!! I also have such wonderful, caring friends here in Houston. They have set up a calendar and they are all taking turns bringing us dinner. I cannot tell you how helpful this is to me and Mac. We appreciate all of you so much and we Thank you for everything that you are doing to help us out! Thank you again for all of your love and support to me and my family during these last few weeks. I really do appreciate every one of your thoughts and prayers...We are very blessed to have such a wonderful support system! Two weeks ago today I had surgery to replace my Mitral Valve. I can't believe it has already been 2 weeks, the time has flown by. I'm feeling better and better each day. My pain is not too bad, I am taking extra strength Tylenol during the day and a non narcotic pain pill at night. I mostly just feel pressure and achy pain in my sternum. Other than that I feel pretty good. I have lost almost all of the weight I gained from the surgery, thank goodness. I am still not sleeping through the night, I get up every few hours mostly to use the bathroom, but I'm pretty much able to fall right back to sleep. I look forward to the day that I can sleep 8 hours straight and lay on my side or flat on my back, but that will come in time. I am taking coumadin every day so I have been getting my blood checked regularly and so far it has been staying pretty close to the therapeutic range that it needs to be in for the mechanical valve. I have been getting out of the house a little bit here and there. One night we went out to dinner and yesterday I went to a movie. It's nice to do things like that, it helps me feel somewhat normal. I still get pretty tired after doing small things, but I'm working on improving my stamina. I go for walks everyday and each day I seem to go a little farther or a little faster. I am very pleased with my recovery up to this point. I was so nervous before the surgery and I didn't anticipate feeling this good so soon after... I guess my memory from the last time was a little distorted. I'm blessed in many ways and I continue to feel thankful each day for modern medicine and all of the skilled doctors and nurses that helped me. Thanks again to all of you, for all of your kindness, love and support. Again, I'm lucky to have you all in my life! Talk to you all again soon! I added a few pictures so everyone could see me!! Well today is my third day being home from the hospital. It has been so nice being home. Each day I continue to feel better and better. I'm walking several times a day in the neighborhood and doing my breathing exercises. Last night I slept in my bed and I actually was pretty comfortable all night long. I still wake up two or three times a night, but hopefully that will get better soon. We had a very nice Thanksgiving yesterday. The food was amazing, I'm so thankful my family was here to spend it with us. My new vavle is the St. Jude's mechanical valve, I'm getting used to the little clicking sound it makes,but sometimes it's weird to hear it. It's most noticeable when I'm exerting myself. Even though it's weird to hear it clicking, I'm so thankful for this little part that can continue my life for me.. Thanks again to all of you, for your love and support. I am so thankful to have you all in my life! Well I am home and I can tell you, it feels so good to be in my own house..in my own bed and chair. I hope to update more details of my experience in the days to follow, but I just wanted to say that I am so thankful this thanksgiving..thankful for life, family and friends and the entire cardiology department at St. Luke's Hospital. I need to say a few special thank yous...first of all to my husband, I absolutely could not have gone through this last week without him. He was my strength and his love and support was so greatly needed. I love you Mac, with all of my heart and soul. 2nd, thank you to my parents for being there every day to help take care of me..your love and support means more then you will ever know..I so appreciate all of your time and energy this last week and I'm glad you were here with me. 3rd thank you to my mother-in-law thank you for taking care of my children like I knew you would.. I did not have to spend one minute of my time worrying about them and I was able to focus solely on my recovery.. I truly appreciate you!! Lastly, thank you to all of you who made posts, sent letters, texts, emails,phone calls and visits. Mac read every single comment to me and they all helped me everyday..I'm blessed to have you all in my life. I will update more later.. Thanks again to everyone. Love Jamie! Good news Jamie has just been cleared to go home. We are waiting on someone to come get her and take her down to the front entrance and we will be on our way! It is my great pleasure to turn over the journal writing duties back to Jamie. I am so proud of the way she has over come this obstacle. Thank you to you all for your thoughts and tremendous support! I would also like to give a special thanks to my in-laws, my mother, Mackenzie and Joey for all of their help. I am truely extra thankful this Thanksgiving. Things were looking good for Jamie to go home today but her hemoglobin level in her blood is still low so her cardiologist wanted her to stay one more day to see if they could get it to come up without giving her a blood transfusion. This morning she got an echo cardiogram and everthing looked really good. She continues to be able to walk farther each day, as she did two laps at a time, three times today. Her parents and I have still been taking her with us to the cafeteria when we go to eat to get her out of her room. After dinner today we showed her the waiting room we stayed in while she was in surgery and took her outside to get some fresh air before bed. All continues to go well with Jamie's development. All her vitals continue to be very good, she is no longer on oxygen and doesnt need her leg massagers anymore. The main issue right now is finding the right medication to deal with her pain that doesn't upset her stomach. She was able to walk all the way around the hall, four separate times and set a new breathing high on her spirometer at 1250 ml up from the 1000 ml she has been doing. We were able to get her out of her room two times in a wheelchair and took her with us down to the hospital cafeteria for lunch and dinner which we really enjoyed. Post Surgery- Day 3-"You're Over One More Hurdle, Girl!" Today the surgical nurse came in and took out Jamie's pace maker wires and said she is looking so good, and "you're over one more hurdle, girl,". The weekend on-call cardiologist came by shortly after that and looked her over and said that seeing her for the first time and seeing how good she looks, it is most likely that she will be able to go home just before Thanksgiving. However, the pain she is experiencing in her left side from the rub on her parcardium, will probably last two to three weeks but is a common side effect she will have to deal with, with the help of pain medication, of course. We went for a walk, the shorter distance, all the way around the hall, did some exercises, and did some breathing exercises too, all before lunch. She told the nurse she no longer wanted to have her morphine or her push button pain killer medicine any more so they unhooked her from most of her wires and no longer needs to push around and be tied to her IV stand. In the afternoon, Jamie's mom got her in the shower and then her mom and dad took her for a walk, the long way, all the way around the entire floor. Everyday her stamina gets better than the last and her determination to over come the milestones in order to go home are simply amazing. The afternoon was less busy than the morning. Jamie took a nap while her parents and I got some lunch. When we got back she had met with her cardiologist who said that the extreme pain she was having on her left side was her paracardiam (the sack around her heart) was swollen and rubbing on something inside, he prescribed her a stronger pain medication via a shot in her hip, that seems to be making her feel much better. Jamie has worked very diligently on her breathing exercises and is improving greatly. We took her for another walk, came back did another breathing treatment, and she had her dinner, she is doing better at each meal. She is still so tired but still looks so amazing for only having her surgery two days ago. Jamie has had a busy morning. The cardiologist came in about 7:00 a.m. and said she looked good and was doing very well except that her breathing is still very shallow and that she really needs to take deep breaths and really work on her breathing exercises ten times per hour so she doesn't get pneumonia or suffer a collapsed lung. 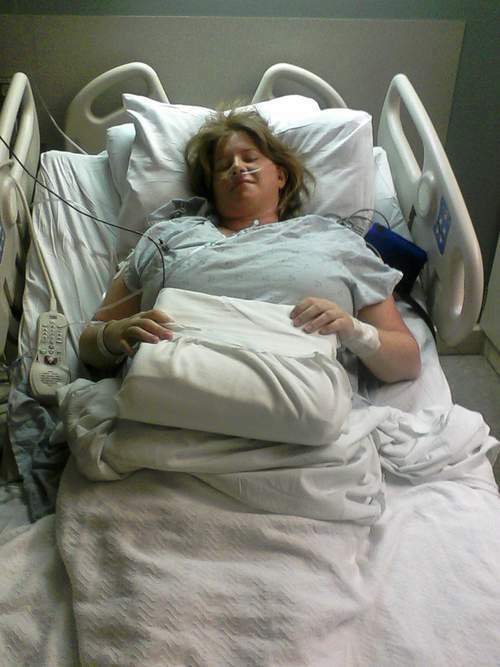 Shortly after that the surgeon came by and said she looked good and the new valve was working good. Next came the breathing therapist and had her do a breathing treatment for about ten minutes. After that we worked on her breathing exercises, Jamie now calls me the drill Sargent of breathing. Time for breakfast, she didn't eat much but she is very thirsty and is drinking a lot water. The occupational therapist came next and had her do some leg exercises that she needs to do three time per day. Next some more breathing exercises, Jamie is very exhausted and tired, but there is still no time to rest. The physical therapist showed up and we took her for a walk down the hall and back. The breathing therapist came back and said it was time for another breathing treatment. After that we did more breathing exercises. Next Laurie and I gave her a shower and put her in her own pajamas and slippers, brushed her teeth and combed her hair. She looks totally refreshed but is extremely tired. Now it's time for her to eat lunch and after that a nap. 8:15-8:45 p.m. 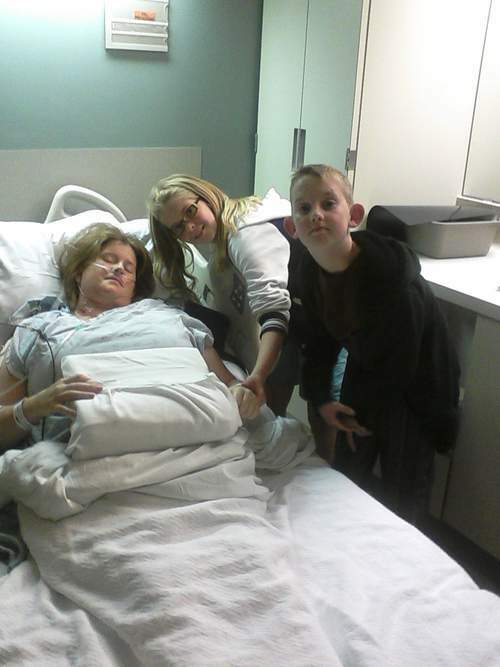 This was our last visit to the ICU. 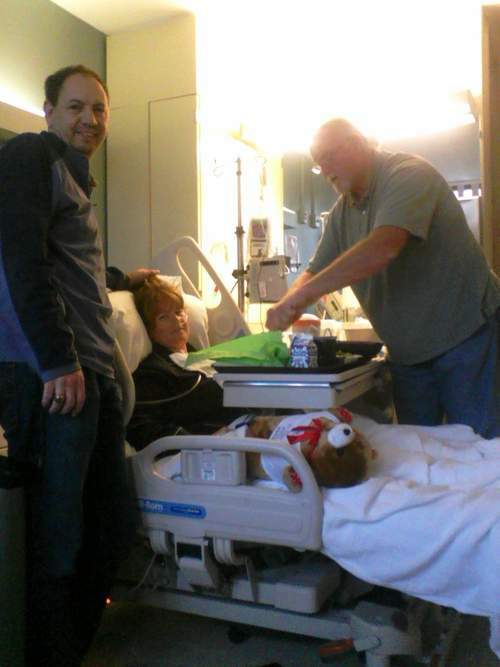 Jamie is out of the ICU and has her own private room now. It has been another very long day, but a very good day as she continues to exceed all the milestones. I am staying the night with her tonight and Joey and Mackenzie are saying goodnight and are on their way home, it is now 9:30 p.m. They are going to be tired tomorrow. 5:00-5:30 p.m. Jamie has received her transfer orders to be released out of the ICU, unfortunately they are still running short on beds so it may take 2.5 hours before it actually happens. She slept most of the time since we last saw her at 10:30 a.m. all her vitals are still really good, her only issues have been her blood sugar was a little low but it is all normal now and she is a little dehydrated so she needs to drink more fluids. 10:00-10:30 a.m. Jamie's chest tubes are now out. She is still sitting up and has been doing her breathing exercises to strengthen her lungs. The nurses say she is one of the best and easiest patients. She is not hungry but she is very thirsty, She asked for some apple juice and was able to drink it. She is still in the ICU but it is due to a lack of recovery rooms not because of her condition. She is still experiencing pressure in her chest and still has a lot pain but looks better each time we see her. 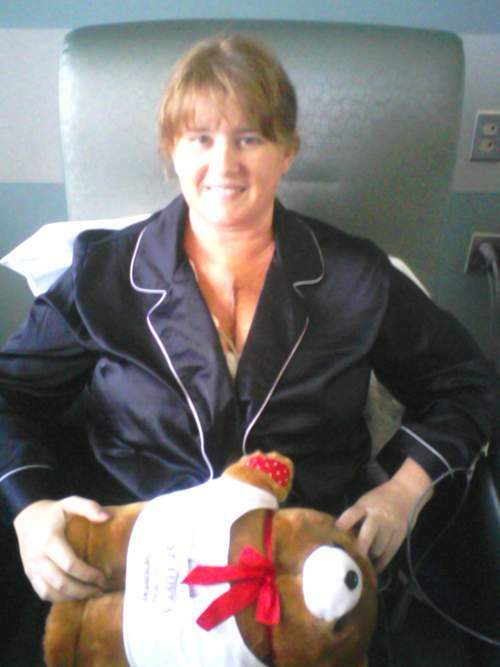 5:30-6:00 a.m. Jamie is still in the ICU this morning and continues to improve. She still looks very good and was able to be moved into a chair where she is able to sit up. We are told that this will speed up the process of getting out of the ICU and into her own recovery room. The cardiologist told her she is doing extremely well and is past the critical point of the sugery and at this point they are just "fine tuning" now. The surgeon is supposed to come by and hopefully release her out of the ICU before the next visiting time at 10:00 a.m.
8:15-8:45 p.m.. The breathing tube is out! She is still in a lot of pain but now she is self administering her own pain medication. She is doing so well Mackenzie and Joey were able to come down to see her and say goodnight. It's been a long day but the results could not have been better. 5:00-5:30 p.m. Jamie continues to improve. She is experiencing some pain, as is to be expected. The breathing tube is still in but she is doing so well that they are optimistic that it will be out be out by the next visiting time at 8:15 p.m. she will be ecstatic about that. Nurse Pauline is taking very good care of her. 3:00 p.m. Jamie is all done and out of surgery. Everything went very well and she looks absolutely amazing. She is still coming out of the anesthesia but she did open her eyes for a few seconds and we let her know she was done and everything was good. The next step will be to get the breathing tube out. We were only able to see her for just a few minutes but we will be able to see her again at 5:00 p.m.
1:40 p.m. The liaison nurse just notified us that the valve is in and her heart is beating on its own ( she said probably better than ours)! They are just stitching everything up now and she should be all done in about an hour, it just takes a little longer due to the scar tissue from her first surgery. Next update will come at 3 p.m.
Our day started at 4 a.m. and we got to the hospital by 5:30 a.m. They separated us and we didn't get to see her again until 9 a.m. At that point the nurses started preparing her for surgery. By 9:30 a.m. Jamie and I were taken to the surgery waiting room where we spoke with the anesthesiologists, the RNs, and the coordinating nurse. It is now 10:30 a.m. And they just took Jamie into surgery where she will start to be put under and the surgery will start. They said it will be between four to eight hours. They promised me they would take care of her. I will post the updates as I get them, the first one should be around 12 p.m. but they said they may not know to much by then. Well tomorrow is the day....I'm so nervous. My Parents and Mother-in-law fly in this afternoon. I can not wait for them to get here, we need their support so much. We have to be at the hospital at 5:30 in the morning. I talked with the surgeons staff on Friday and they said that he did have one other surgery scheduled for Wednesday as well as mine. I'm not sure if I will be first or second. If I am second, the updates will start later in the morning..but keep checking and if you want to you can text Mac or my mom. My mom will also put some updates on Facebook. Today I can tell you that I am 100% sure of my decision to have the mechanical valve put in. I know that I will have to live the rest of my life on blood thinner, but right now I would much rather do that then think about ever having open heart surgery again. I just know that I do not ever want to do this again. The last 6 weeks have been so hard. Just thinking and anticipating this surgery. I do not ever want to have to think about it again. So the mechanical valve is the right choice for me. Hopefully tomorrow afternoon I will be well on my way to recovery and putting this behind me! Please continue to pray for me and my family..for strength and courage. Please say an extra prayer for my surgeon, that he will be able to do this quickly and effectively and not encounter any significant complications. Thank you so much for all of your continued support, your emails, messages on Facebook, signing this guestbook, texts, and phone calls have helped more then you know. I know that being so far away from most of you is really hard, but all of your support through this means so much to me and I thank you from the bottom of my heart. This will be my last post, until I am able to type again. Mac will continue to update you on my progress! Thanks again..I am truly grateful to have each of you in my life! 1 week to go until I have my surgery....I have been getting things around here ready.. Last week we bought a recliner, I think it will be so nice for me while I'm recovering. All I have to do is push a button and it reclines me. From what I remember about the last surgery, laying down isn't very comfortable so I'm hoping that this chair will be helpful for me. Also, With the help of two very cool friends I think I'm set with all the comfortable pajamas that I will need..several of them button down the front and I know that is going to be easiest for me....My Parents and My mother-in-law got their airline tickets to come to Houston last week as well. All 3 of them are going to stay and help me, Mac and the kids for 3 weeks. I'm so grateful that the 3 of them can be in my house together and that they would give up their time at their homes to come and be with us. Mac and I need all of their love and support and I am truly grateful for them and what they are willing to do for me. My brother also got his plane ticket to come and spend the 4th week of recovery with me, I am really looking forward to having him here as well... Mac's boss is allowing him to work from home for the rest of the year, that will be really great for us...he will be with me all the time until I'm fully recovered, I couldn't ask for anything better!! Today I have been having a difficult day, I'm so anxious and nervous for this surgery. I just want it to be over and I want everything to work out without any complications. I'm trying to remain positive and strong, but sometimes it's overwhelming...I'm not a very religious person, but I do believe in the power of prayer, so I'm asking you all to please pray for me, that I will continue to be strong and have some peace and comfort that I will get through this.. Thank you all so much! I'm so glad I have all of you in my life! I'm going to try to update this journal a lot in the next week and Mac or my mom will do it when I go in for surgery and until I can get back on...Thanks again for all of your love and support!! Well, today I met with my surgeon, Dr. David Ott. He answered all 30 questions I had for him quickly and efficiently. I can say that he and his staff made me feel very comfortable and gave me information that let's me feel confident that I can trust him with my life. Dr Ott is one of the best surgeons in the nation and he has done thousands of heart valve replacement surgeries. I really feel like he is the best one to do my surgery! He recommended that I get the mechanical valve put in this time. He is the second Dr. To recommend that for me. He says that I would have a lot harder time with success rate and recovery with a third heart surgery if I used another tissue valve. So at this point I am 95% sure that I will be using the mechanical valve. I am so ready to not have to think about doing heart surgery again! Thank you for all of your thoughts, prayers and friendship. Just knowing that I have all of you in my life makes this so much easier. I love you all!! Talk to you soon! Yesterday I met with my cardiologist here in Houston. With his advise, Mac and I made the decision that we are going to prepare for me to have surgery in the next month or two. They made an appointment for me to meet with a surgeon on Tuesday Nov 1st. So I guess I'm going to get this process started. I'm anxious to meet the surgeon as I have a lot of questions about if I should do a mechanical valve this time or if I should do another tissue valve. I'm still not 100% sure which one I want. Hopefully he can help me make that decision. I will let you all know what he says and keep everyone updated as to how things are progressing.